Nepal has been maintaining certificate standard AFP surveillance since 2001. The surveillance system is sensitive enough to detect polio cases and circulating derived poliovirus. Nepal was declared polio -free by the Regional Certification Commission on 27 March 2014. 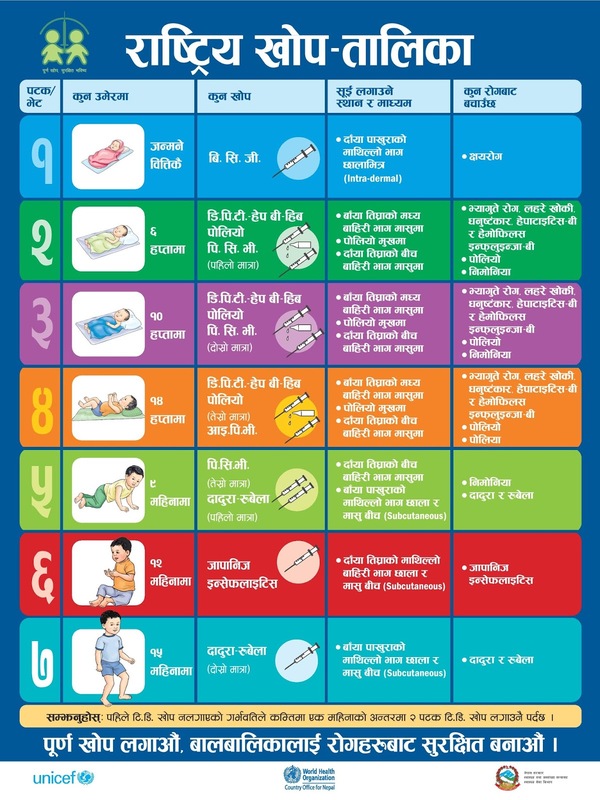 Nepal adopted the strategies developed by the WHO such as active AFP surveillance, Routine Immunization, SIAs and Mop-up to achieve the goal of Polio eradication. The CHD took lead in planning, delivering and managing the National Immunization Program including polio throughout the country. The community based interventions together with the national and international learning have been accounted for this success in the functional partnership and community based approaches. Routine immunization: Routine immunization is the cornerstone of polio eradication. Uniform and 95% OPV3 routine coverage increases the immunity level in community and thus interrupts the circulation of WPV transmission. Hence, the access of routine immunization services should be expanded at grass-root level. Supplementary Immunization Activity (SIA) - (National Immunization Days & Sub National Immunization Days) National Immunization Days aiming to improve universal coverage should be conducted on regular basis. It is an additional national or subnational mass vaccination campaign designed to vaccinate all children under five which helps in interruption of transmission of wild poliovirus. It aims to vaccinate everyone under five, regardless of their previous immunization status. Surveillance of acute flaccid paralysis (AFP) - All AFP cases (suspected polio) are detected, reported and investigated. This allows for the identification of any remaining reservoirs of wild polio virus and helps in the decision making for the SIAs need. Mop-up campaigns - These are intensive, house to house campaigns that are conducted during the final stage of polio eradication. Mop up is conducted when the polio virus is confined in a limited geographical area, where all children are tracked and vaccinated reaching each house hold, even after successful implementation of NIDs and routine immunization. Introduction Of The Injectable Inactivated Polio Vaccine (IPV) IPV is being introduced in Nepal in order to quickly maximize childhood immunity to polio and maintain the country’s polio-free status. IPV has been proven an extremely safe and effective vaccine and has been used successfully in many developed countries for several decades. It is important to note that IPV is recommended in addition to the oral vaccine and does not replace the oral vaccine.